Whet your appetite for the coming feast. Watch the official trailer for the second season of the Chef’s Table TV series, dropping to Netflix, May 27th. Don’t have to worry about it being canceled too soon. Last month, Netflix renewed Chef’s Table through the fourth season. Dominique Crenn, Atelier Crenn (San Francisco); Enrique Olvera, Pujol (Mexico City); Gaggan Anand, Gaggan (Bangkok); and Grant Achatz, Alinea, Next, The Aviary (Chicago). Watch the Chef’s Table TV show’s official season two trailer, from Netflix. Here is more, from Netflix. The first course of six episodes premieres on Netflix Friday, May 27 followed by four special episodes later in the year dedicated to four of the world’s most renowned French chefs, with the third course highlighting another six chefs to release in early 2017. Audiences are invited back to take another globe trot in Chef’s Table Seasons 2, 3, and 4 where the series will showcase a variety of chefs from all over the world; talking about what inspires them and how it translates into their individual styles. The filmmakers embark on a personal look into the daily lives of these carefully curated chefs, from their diverse backgrounds to the evolution and craft of their chosen cuisine as well as their quests for sensory perfection. A Boardwalk Pictures production, Chef’s Table is created, executive produced and directed by David Gelb. Clay Jeter, Andrew Fried and Brian McGinn return as directors, with Abigail Fuller directing as well. Fried and McGinn are executive producers with Dane Lillegard as Co-Executive Producer for Boardwalk Pictures. What do you think? 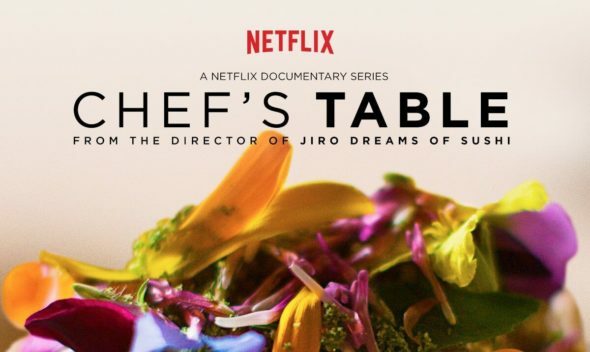 Are you a fan of the Chef’s Table TV show on Netflix? Will you binge on the second season, or consume in moderation? More about: Chef's Table, Chef's Table: canceled or renewed?, Netflix TV shows: canceled or renewed?